UPDATE 8/17: Recent donations will keep the site going for the remainder of the year. Also added a donations status panel on the homepage for anyone curious. Use that for the definite and most recently updated status. I'm quitting SS or going very inactive. As for SSherder, it doesn't take a lot of time to manage, really just an hour every two weeks for each update, but I do have a problem with paying server costs for a website of a game developed & published by companies I have very little respect for. So I've also decided to allow donating (bottom of page). Donations will go towards server fees, excess amounts saved for next month's bill. I'll see how it goes for 1 or 2 months before deciding what to do with the site. Contact me if you have any questions, best method for me nowadays is probably on Discord (zkwp#7907). These had to be happening for the memory leak to occur on responses from this domain. However, it doesn't really hurt to change your password just for good measure. Additionally, if you use Discord, reddit or other CloudFlare-using sites, you should change your passwords there too, along with accounts on other websites which use the same password on sites which were affected (don't do this in the future, or at least use unique passwords on your extremely important accounts like banking, Google, etc). Now on to site news, it's been awhile since my last update, I'm not dead and the site has still been receiving data updates (for new characters, skills, etc) right on game maintenance day, along with some site improvements here and there when I have time. I got a bit lazy with these blog posts because it was getting a bit annoying doing them every 2 weeks when there was a data update. I also haven't had much time and motivation to work on the site, however, it'll continue to be available for the foreseeable future, along with receiving site updates here and there. Also, if you need to contact me and want a swift response, I think Discord would be your best bet. I can be found on both the main SS Discord servers (check /r/soccerspirits sidebar to join them), username is zkwp. Could also just post on ssg. Thanks for the feedback from here, I agree with most of the suggestions posted and will be implementing them soon, would've liked to have implemented today but I haven't had a lot of free time recently (I hate new CoT). The Character Book section was a bit of a mess, it was bulky and it only supported chain toggling one by one. Because its only purposes were setting ownership of characters (used only for chain eligibility calculations) and chain completion status, its been replaced with a simpler Chains section. It has two tabs, one for bulk-editing ownership and other for bulk-editing chain completions. The Statistics section has also been removed, the Chains section at the bottom has tools for tracking completion and eligibility, viewing progress by four categories: Chains, Chain Missions, Chain Matches and Dimension Stones, and being able to view progress specifically by element and rarity. Revamped User Formations section, lots to do there. 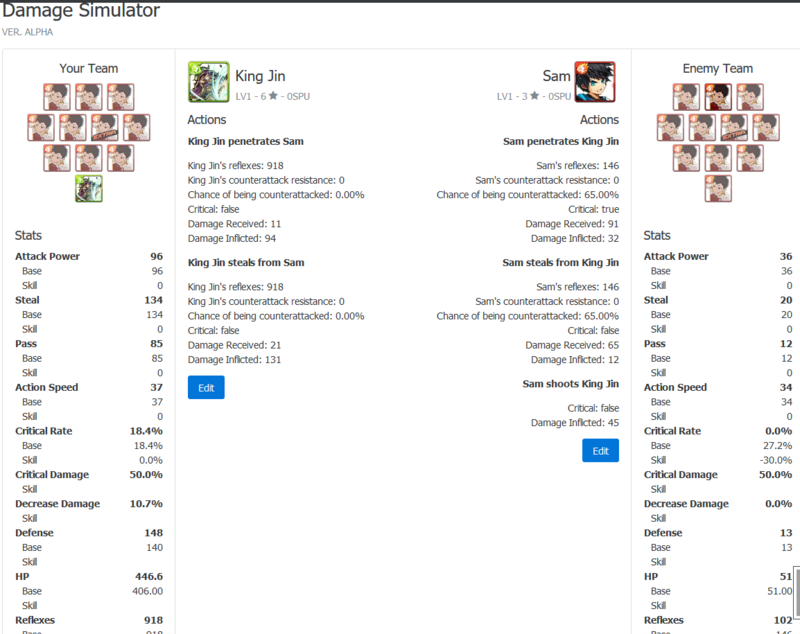 Afterwards, user formations will be able to be imported in to Damage Simulator tool. UPDATE: I made a mistake which accidentally wiped chain completions, sorry. Bug is fixed now. UPDATE 2: I've partially restored chain completions from a backup from last week, 8531 in total. All UserBaseCharacter objects which had chain_completed set to True on 26th of September, 2016 have been restored. Sorry again to any new users who joined after that date. There shouldn't be any problems from here on out. The Data API has received a few minor changes, skills endpoint is finally up and running properly. For anyone using character image URLs in bots/scripts, change "418x636" to "588x882", the site's now using higher quality images created from BB's hosted PNGs (previously TGAs), rather than the annoying KTX crap. Today's data update was a little delayed because BB have shuffled some things around, though it was still only an hour or so after maintenance end for it to be updated. Also been taking a small break because tired and busy and stuff. I'm aware some character portrait and character icon images are messed up, will fix soon. A few days ago I released the early version of it, didn't make a news post about it because I've been updating it every day since then. Its been a pretty huge undertaking, the codebase for it exceeds the size of all the other components of the site put together and it's very complex, there's still a lot of work left to do on it as well. Check it out here. Because it receives a lot of updates, the damage simulator will have its own changelog on that page, so check that whenever you want to know what's changed. I'll also probably throw the site's typescript codebase on the "ssherder-issues" github repo, would be nice to use it for something other than just a channel for users posting bugs/suggestions, others could then contribute or just peruse it to check out things like skill effect calculations. Started using flexbox in some parts of the site. If you're on IE8 or IE9, I don't care, update your browser. If you're on IE10 or IE11 and the layout is messed up, let me know (only has partial support). Also started using Vue.js, currently only using it for damage simulator. The site went through a bit of a cleanup, you might notice some visual differences. Still working on new features and improving existing ones. One thing I'm making is a damage simulator (Image), as you can see it's still very WIP, though it can already do some neat stuff like handling skill targets (who receives the buff/debuff), e.g. in the image it's applying Jin's crit rate debuff to Sam. I'll release the alpha version of it hopefully within the next week. After I do that, the functionality of it will be ported to the user formations section. Removed Chart.js from libs, unfortunately this means the user statistics section is temporarily disabled. Reasoning: far too large filesize. Will revamp section soon, sorry! Standard update for latest game data. Regarding the JP characters (Jade Rakshasa and Elua, more to come), the VA listed in their character profiles is still the KR/Global one. The site currently uses no JP server data, all of it is from KR/Global. Successfully up to date with the data from the latest patch. I'll be adding support for the new transcendence points thing too soon. Character endpoint modification: The season property is now being used for the classic/new availability system. 1 = Classic, 2 = New. This is also how it's treated in the game's data files. Yet another update for latest data. Regarding the major patch next week, it may take a little longer than usual for the site to update depending on how significant the system changes are, though from what we know it should be simple, just the level cap increase to 70 and possibly a skill point cap increase from 18 to 20. The ace select input in the edit formation UI will no longer reset whenever a character is added/changed, it now respects the previously selected ace. If the user removes a character selected as ace, it'll default to the first available option. Another update for latest data. I've been taking a bit of a break recently so there's not much new aside from latest data, I'm planning a few things for release around late July/August. Another small update for latest data. Just a small update for latest game data. Still working on better formations and some general QoL improvements. Added 6 or so missing character artworks, the ones from the S2 legendary EE patch a month or so ago. This section addresses a few problems with how things were set up with the Character Box. Because chain eligibility was originally being calculated based on the characters you already have in your box, it kinda encouraged people to start adding characters that they previously owned because of how chains work. Same thing was probably happening with users adding characters they no longer possess whose chains they've completed, just to track chain completion status. Since the Character Box is really just meant for managing characters which you currently possess, I've made this separate Character Book section which is there to simply track ownership (including past ownership) and chain completion status of a character. Chain eligibility in the Character Box and Statistics section will then calculate eligibility from there, rather than the Character Box which was how things initially were. For people who've already got their Character Box set up, there's an import button to automatically mark all the characters you have as "owned". There's still some improvements left to make, I was thinking about making the ownership of a character in the Character Book automatically set to "owned" whenever that character is added in the Character Box but the problem is that sometimes some people will just want to test out certain characters, they'll also sometimes import the wrong characters. Anyway, you have an option in your settings to choose how chain eligibility is determined, whether by this new method or the previous method. SSherder enters a new phase! TL;DR: Site has been revamped massively and now supports managing characters, formations and materials. Things are a bit of a mess right now, so expect some quirks here and there. Freddie, creator of PADherder. Lots of frontend functionality was fast tracked thanks to him. I also shamefully used a lot of his ideas. kpaekn, creator of his SS database website. He helped me out with data extracting, saved me a massive amount of time. Community, for ideas, bug/inconsistency reports, feedback, etc. Users can manage characters from the characters section, creating them as they are in-game, providing analysis on chain eligibility, evolution eligibility and just being able to keep track of characters better. You can then create formations with the characters you have here, and split them up in to groups, e.g. one for CoT, one for CoD, etc. You can also share them with others if your profile is set to public. The materials section is basically a more convenient way of tracking characters whose only purpose is being used for evolutions (they can't be leveled, ST'd, etc.). Rather than making these generic characters one-by-one in the characters section, you can just update the count of each one from the materials section. Anyway, this section also provides analysis on how much of each material you need to evolve the characters you have. Allowing users to select their managers, which could feed info to multiple sections of the site. Like including the + stat amount if you're using stat managers. Allowing users to select their club facility levels, again, would feed analysis in to other sections. A character book section. A separate section is really needed for users to be able to keep track of character ownership, chain status, etc. Characters section, I thought I'd have enough time to finish it off during DNS propagation but apparently not. Though I do plan to expand on it a lot, it's going to have some really cool features like searching by skill effects. Better charts in statistics section, the library being used for it is neat, but limited in many ways, when I get the time I'll try create my own solution. I really wish Google Charts was open sourced so I could use that. I plan to support the site with just donations, though they'll come later on when I know the site is stable. I don't think advertisements would be effective on this type of site anyway, though I'm not a marketer (thank God) so who knows. There was probably a lot more things I planned to write here but I'm way too wrecked too think right now.